A good educational game offers engagement, assessment, and learning, with the game data providing a valuable invisible assessment opportunity for students, teachers, and parents. Over the past several years, there has been tremendous interest among educators in the use of digital games as serious learning. 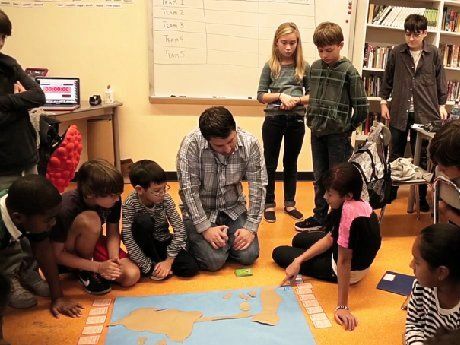 Advocates of game-based learning for K-12 students cite the value of digital games to teach and reinforce skills that prepare students for college and career, such as collaboration, problem solving, creativity, and communication. Not as often discussed is our ability to use students' in-game actions as evidence for the assessment of skills and knowledge, including those not easily measured by traditional multiple-choice tests. Traditional assessment methods often require teachers to interrupt classroom learning and administer tests. In contrast, invisible assessments make use of technology to record information about the ways students interact with learning material in a seamless manner, without interruption. Hence the term, "invisible." Invisible assessments such as games provide teachers, students, and parents with immediate feedback about progress, enabling them to make timely adjustments to teaching and learning approaches. They also enable educators to build models of student learning and proficiency by capturing many observations of a student over time, without the pressure of performance on a single test. In games, educators can observe a student's sequence of actions, time spent on tasks, multiple attempts at activities, requests for help, communication process, and so on. In other words, games allow us to examine a student's process of problem solving, not just the final product at the end. These observations can help educators make valuable inferences regarding students' mastery over skills, while offering new ways to assess factors not easily measured on multiple-choice tests, such as problem solving, critical thinking, collaboration, persistence, and creativity. It is important to note that the term "invisible" does not imply that learners or teachers do not know that assessment is happening. Rather, it implies that the actual activity of assessment is not visible, or interrupting the classroom. Just as when playing a game, players get feedback and scores as a regular, expected part of play, so with all digital learning activity, we can be providing information about proficiency and suggestions for other activity. Educators must be careful, however, not to confuse educational games with the "gamification" of education. Gamification is generally defined as the use of game design elements in non-game contexts. A game, on the other hand, is a system where changing one element results in (often unforeseen) changes to many other parts of the system. There is little to no evidence that applying only selected game elements outside of a game will yield positive learning outcomes. Quality educational games must balance engagement, assessment, and learning as three equally important components. Engagement relates to a game’s "fun factor." Assessment is the ability for educators to gain key insights from a game regarding student abilities, and learning is the level to which a game effectively teaches skills and information. The key is to balance these factors so that games are both fun and educational, while providing the information educators need to assess and improve student outcomes. A number of quality games exist today that successfully balance these factors and have tremendous potential as tools for both learning and assessment. However, much work is still needed to maximize their value, particularly in the area of integration. As of today, games and game data often exist in a silo. By making them a seamless part of curricula, there will be less of a burden on each individual teacher to determine when and how to integrate games into the classroom. By integrating the data with other gradebook-type information, teachers, parents, and students will get a richer picture of student knowledge, skills, and attributes. While games do not fit into the current model of assessment for accountability, they do offer the opportunity to engage and attract learners while providing information useful for making immediate on-the-ground adjustments to teaching and learning plans. The potential of educational games will continue to grow as computers become increasingly ubiquitous in schools, and as game developers work ever more closely with education experts. If schools and teachers can collect and accumulate meaningful evidence from students' everyday interactions with games and other digital tools, we have the potential to create new models of students' knowledge and skills that expand our ability to both understand and influence student learning.